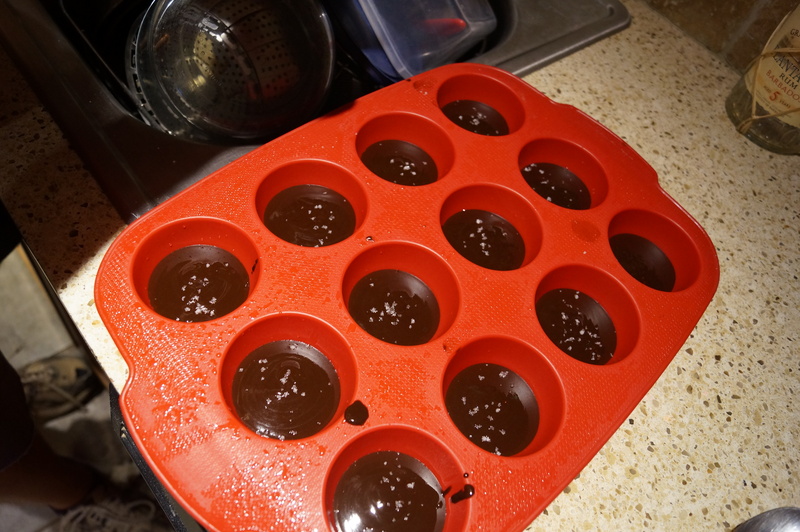 Making chocolate must have taken up some energy – more than just unwrapping it, which is about as much as I can manage. Still haven’t started my radio play. Can’t make up my mind what to write about. Have agreat new year, and best of luck with your wip. Yeah, definitely more work, but worth it. The little bits of sea salt on top were delicious. I totally understand about your play. Can you try fleshing out one of your characters a bit, just get them talking and see if they come up with something that has to be written? Good luck! Thanks, I’m hoping they’ll work. The bread thing is amazing. I know it sounds weird and the people watching me make them were like: what??? It came from a recipe for an indian bread potato roll and you just moisten a slice of sandwich bread (with the crust torn off) until it’s pliable and then dollop your filling in the middle and wrap the bread around it. Then just plop it in the fryer. I added a couple of pictures and the website link to my post because I know it sounds so weird. Totally understand. They shouldn’t be on my radar either! Love the Narwhal, that is beyond cute! Made me smile. Thanks. 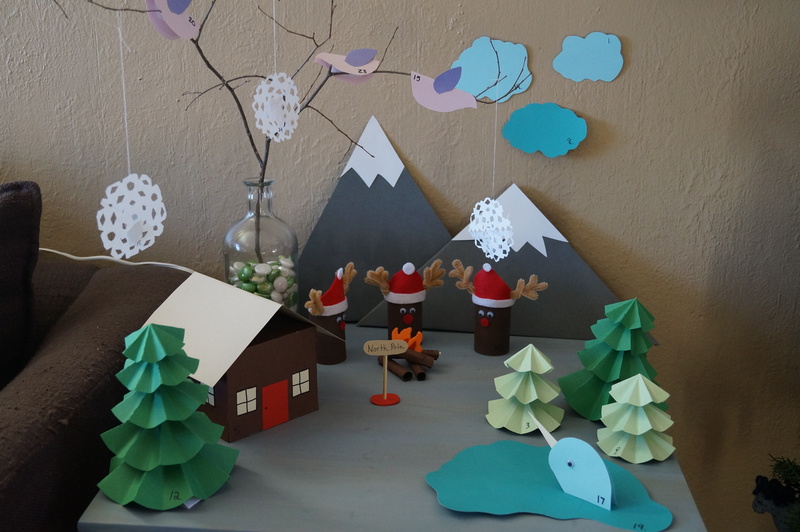 Once I decided my woodland scene was in the North Pole, I knew I had to add a narwhal. In the movie, Elf, Buddy the elf talks to Mr. Narwhal, who lives in the north pole. It was the first time I’d heard of a narwhal and didn’t even think it was a real thing at first. Love the Narwharl! 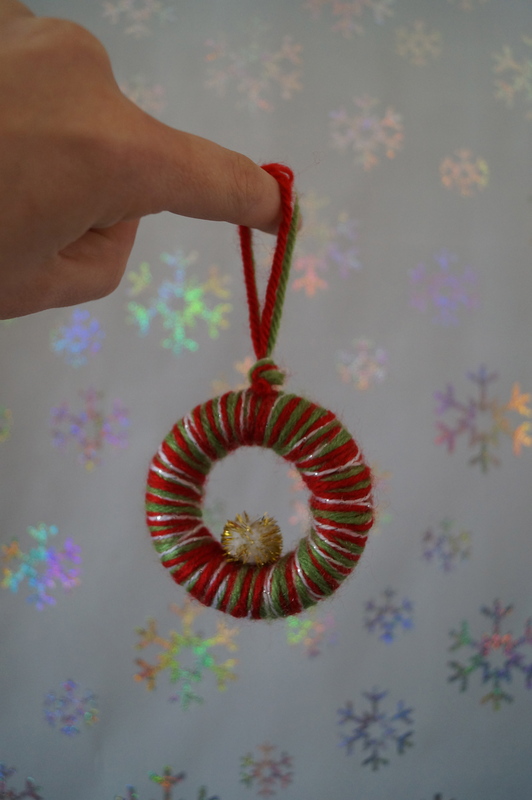 Also love the mini wreaths! I definitely identify with your first point. Last year I was doing super well with losing weight and then along came the flu, swiftly followed by viral tonsilitis, and a week later – glandular fever. Took months to get over that one, then more tonsilitis and then of course my sprained ankles complete with torn ligaments. My exercise regime totally went out the window this year. Definitely planning to get back into it for 2014! Oh, thank you. 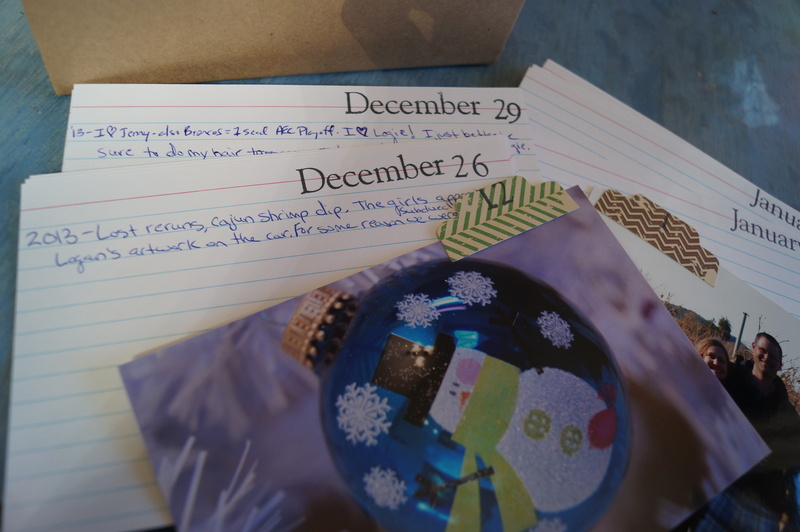 The advent calendar was fun, because I got to add my own little touches. And the wreaths turned out nicely and were a lot easier than I thought. What a bummer about all your health problems. I’m so sorry. It’s hard when life throws all these obstacles in your way–and you had a lot of them. Good luck with the new year!! Number four is a really cool idea. I’d love to journal every day. On a few of our trips I have kept up with it daily and looking back at those is great fun. Good luck with your goals and don’t feel bad about your novel – the holidays are hard to work through. You can regroup on Jan 2. I made it (#4) as a gift for my husband and gave it to him on Christmas (just imagine stamping 365 index cards!). We’ve kept up on it so far, which isn’t that long, but hey it’s a start. I just keep reminding myself how fun it will be a year from now. I’ve tried to journal on my trips as well, and usually get through couple of days. I don’t know what it is, I just lose steam. And your trips seem so long, I don’t know how you manage to stay on task–you even blog while you’re gone! What helps me journal as we travel is to record a quote of the day, whether it be something we said or something we heard. 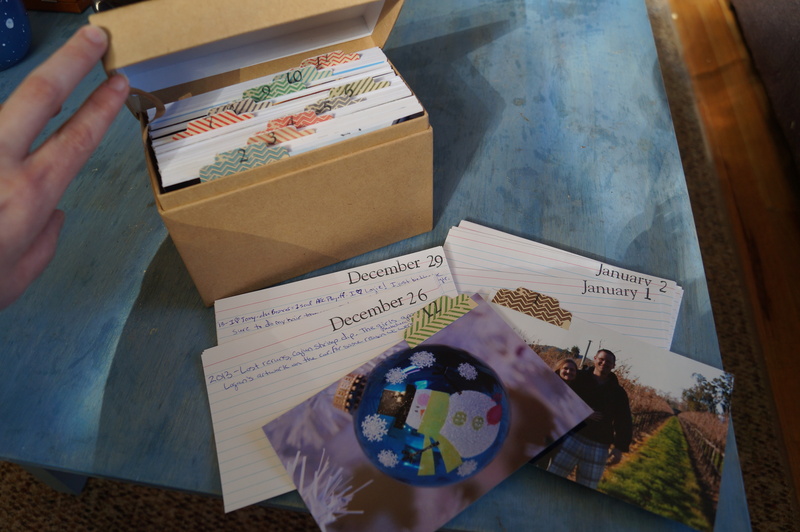 Like your index card box, it is fun to look back on. As far as blogging on the road goes, I started last year and found it to be pretty easy since I as already keeping a journal. I just tweak what I’ve written. Hi Jennifer, I love your exercise resolution, not too specific so it’s hard to mess up. 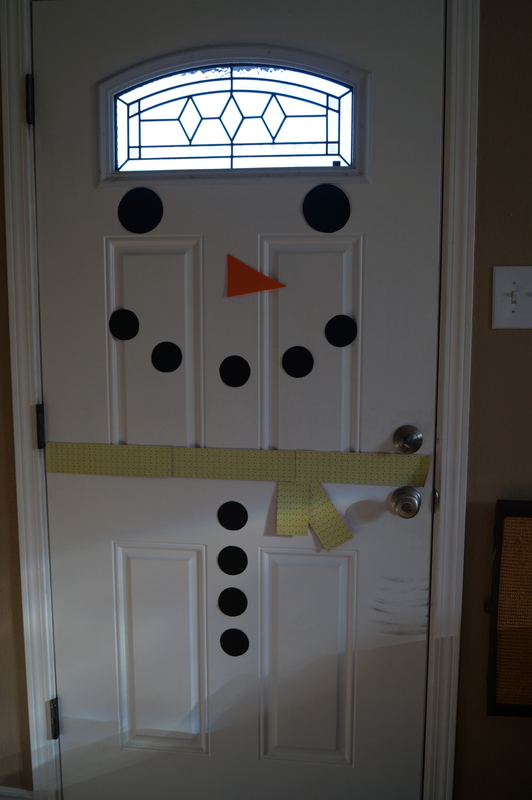 Cute ideas , I love the advent calander, and the snowman door. I think the Narwhale looks happy in the lake. I have missed your wit. Happy New Year to you. I like the exercise program too. Thanks. I took a little break for the holidays. I tried to set the exercise program up so I couldn’t fail. I thought it would be more motivating if I felt like I was being successful and not feeling guilty about not sticking to a strict regimen. Great resolutions. Mine look very similar. I like that you are so ambitious with certain ones. I know that doing 1,000 words sounds easy sometimes, but in reality, there are just some days where it feels impossible. And a book a week. I wish I could do that. Would love to do that. I think that might be on my list as well. I know, just like you, there are annoying people out there that can read a book a day. But I just can’t. So you are not alone. Those bread rolls look amazing! Yeah, a thousand words a day probably won’t happen. I just need to focus on writing more. And there are people who can write that much (I think you posted about this before) and I don’t know how they do it. Sometimes I just need to sit and think and daydream. I probably could do the book a week if I made myself, but that doesn’t sound like any fun does it? And I don’t want it to be a chore. I just want to do more of things I enjoy. So, I’m hoping for a book a week, but if not that’s okay too, as long as it’s more than I did this year. Yeah, I remember touching on the topic and I totally agree with you. I don’t want writing to feel like something I HAVE to do. Those people who say they write from compulsion…err…WTF? haha! Sometimes its the hardest part of my day, sitting down and forcing myself to be calm enough to write. I want to read more, but somehow it gets pushed to the bottom of my list. I hate that, but I get a guilty feeling sometimes when reading, like there is something else I should be doing. Do you ever get that? Must try those bread rolls. The family begging for new recipes, so I’ll have to try them out. Writing shouldn’t be a chore, that’s for sure. I’d be up for some motivation 🙂 We need to find a way to carve out the time, make it a priority, but again: not a chore. I usually read at night, right before I go to bed. Or when I have 10 -15 minutes here or there, I might sneak a few pages on my kindle. 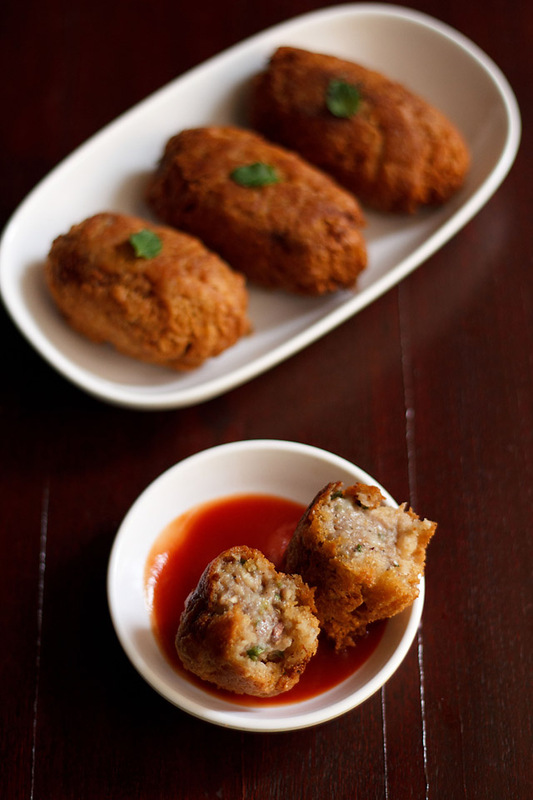 The bread rolls are amazing–just be careful with the deep frying. It can get a little crazy if you have it too hot! I do consider walking between the fridge and the couch, or other sitting apparatus exercise. For myself, I make vague goals for the year. Right now, I’m working on a structured to do list for the next few months, especially when it comes to my writing plan. I suppose my main goal is to give myself deadlines for writing projects to try to push myself to finish things at a faster pace. That being said, things like holidays, the flu, and other life events make it difficult to keep on top of those deadlines.